fireplace are brick fireplaces with faux wood mantels or exquisite looking fireplaces made from marble and even designs that are made from tiles. The choices available can be overwhelming, so be sure that your fireplace fits in with the decor of your room. Brick fireplaces come in all shapes and sizes. So even if you don't want a "traditional" looking fireplace, you may find that the look and feel of brick is right for you. One of the great things about brick is that it can get old and beat up looking without losing its charm. Many fireplace owners feel that the aged look is part of that charm rather than something that detracts from it. If you've ever seen a brand new brick fireplace, you may understand what they're talking about. The brick is all shiny and new. It gleams. It looks nice in a way, but it doesn't look "natural." You feel as though you want to take it through a season of fires to break it in. Then it will look the way a brick fireplace ought to look. Then it will have that patina that adds warmth to the home even when there isn't a fire going. Keep in mind that the stone used in a stone veneer fireplace needs to be durable and not susceptible to heat damage. Limestone, granite and dense metamorphic rocks can stand up to heat with no issues. Avoid soft rocks, slate or any other rock that crumbles fairly easily. The inside of the firebox should absolutely be built with hard firebrick set in fireclay, not mortar. Mortar used in between firebrick almost always crumbles when subjected to the repeated heat of fires. Fireclay is the preferred material as the joints between the brick are small, and the fireclay tends to vitrify with each fire. If you are planning a renovation, remodeling or refacing of your old interior stone brick fireplace or construction of a new one, you've come to the right place. 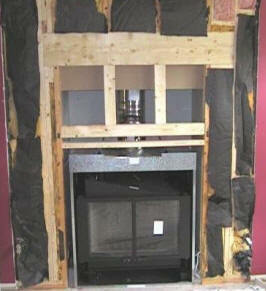 The homeowner wished to have a wood burning 'Zero Clearance' fireplace installed on this wall of their living room. The trick here was to build it in such a way so that the finished face of the fireplace would be flush with the existing wall. Here we see the exterior of the same wall depicted above. After opening up the wall at the desired location, we framed a rough opening, complete with a header to support the exterior wall where the old studs were removed. Note that the new framing members are kept a safe distance off of the fireplace box. The bricks have been cut away and new walls were framed up to enclose the fireplace box. 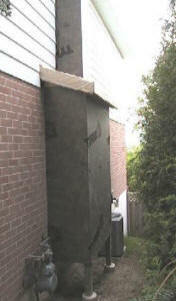 Further, a 'chase' was built to cover the insulated steel chimney. Once the framing was complete, we proceeded to patch up the drywall. The drywall repairs were completed with a coat of primer. 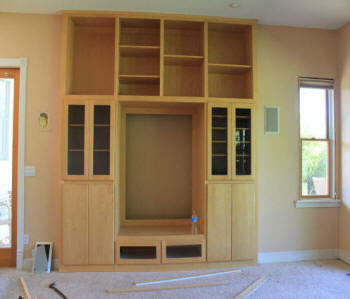 The homeowner elected to finish off the fireplace mantel and paint at a later date. 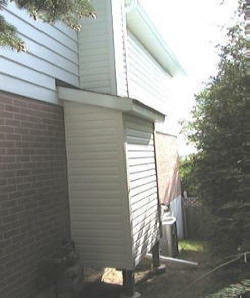 The exterior alterations were completed with vinyl siding. Here's a picture of the completed fireplace mantel. Cost Effective. If you are budget conscious, painting the fireplace brick would be the cheapest, simplest and easiest way to renovate your fireplace. Brick paint does not only give your fireplace a neat and new look but somehow it adds a contemporary color scheme not just to the said but to the entire room. Be sure to choose soft, light and trendy colors that would not just leave your fireplace just a dark and smoky fixture in your home but an attractive focal point in your living room. Accessorize. You can also change your fireplace atmosphere by just simply adding a large mirror or a picture on the mantle. This is will add depth not just to the fireplace but as well as the entire room. You can also add two tall candlesticks that would add elegance to complete the look. Other things that can be added to your fireplace are: your sea shell collection, rock collection and even a flower vase. Such idea is just one of the effective and cost friendly means that would change your fireplace’s look. Fireplace Screen. 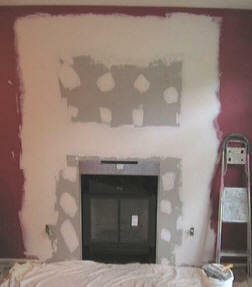 Changing fireplace doors or screen is also an effective way of doing a makeover on your fireplaces. There are various choices of fireplace doors and screens to choose from. And these come in countless styles and designs. Just be sure to choose the very kind that would compliment your fireplace’s design and style. 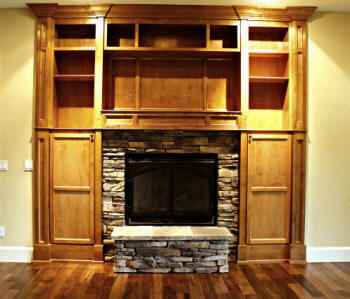 Making over a fireplace is a simple task, it just needs a little of your creativity and imagination. Hanging Branch with Tillandsia. This is a combination of modern and nature inspired innovation on a fireplace by hanging it in a twisted branch in the ceiling above the fireplace. Such style draws anybody’s eyes upward that visually connects the said fireplace to the house ceiling. To make it more interesting, paint the branch with a color that contrasts against the wall paint. Mirrors. 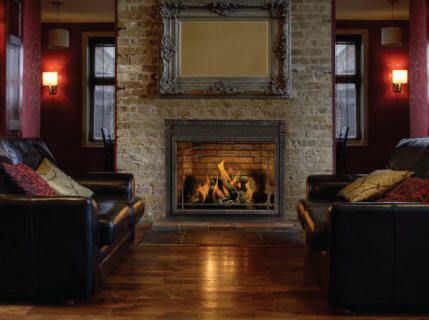 Placing a mirror on top of the mantel or the fireplace itself is another revolutionary idea. Such would lead to make the room look and feel larger and this also visually links the fireplace to the ceiling. And it also makes the fireplace look more glamorous and attractive. Tile. Another out of the box idea is adding bright colored tiles in the exterior part of the fireplace. Such would give the fireplace a modern touch that somehow alters the atmosphere of the entire room. Just remember to choose a tile coloring that would go with your wall paint and home décor. Painted Brick. Having your firewall bricks painted adds a cool and contemporary look to the said and the entire room. 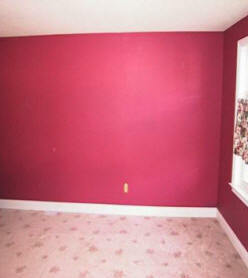 Just use a paint color that would complement your house wall coloring and definitely you would go no wrong. These are just some of the cool fireplace ideas from around the web that may go with your liking and style. It is just a matter of experimenting and considering some unusual ideas and who knows, in the end you might strike gold and end up having a one of a kind fireplace design<. The effect a roaring fireplace can have on the senses is truly undescribable and the design element alone can bring any room to life. With choices of wood burning, electric and gas, you can also have the choice of the fireplace design as well. For example a corner fireplace for gas connections is something out of the ordinary and unique. The first thing you need to is make sure that you have the room and all the appropriate gas plumbing has been taken care of before you decide on buying your gas fireplace. There is no doubt that a corner fireplace has great appeal and will look great but if your room is small and overcrowded, then it is going to end up looking a mess. Other things to consider is the cost of gas, its not cheap, especially in the winter! However, if you just plan to have it for special occasions and decor purposes, then your making a great investment. Even though they may not be the standard type of fireplace most people go for, you can be sure to get many varieties and styles. From modern to classic, traditional and even custom built for your home. 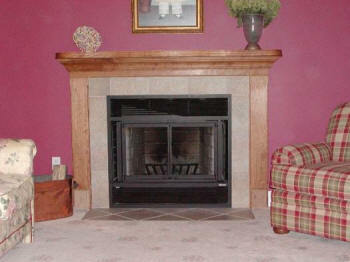 Getting a corner fireplace for gas outlets is just as easy easy as finding an electric fireplace. The effect a roaring fireplace can have on the senses is truly indescribable and the design element alone can bring any room to life. With choices of wood burning, electric and gas, you can also have the choice of the fireplace design as well. 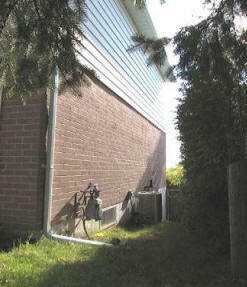 For example a corner fireplace for gas connections is something out of the ordinary and unique. Keep in mind that the fireplace will be the focal point of the room, so decide clearly on the design style you’re looking for the entire space. You’ll want everything to work together cohesively, from wall color to furniture to accents pieces. Remodeling your fireplace isn’t a small job, all things considered, so be certain about the look you want as you’ll be living with it for some time. While you want a standout fireplace, for most of us space is way too valuable to not think practically about. So make sure your fireplace remodel works for your family. Now’s a good time to decide on the size and functionality of a mantel and whether your want built-in shelving on either side of your fireplace. And most importantly, if your fireplace will be a working one, ensure all safety inspections and upgrades have been done to ensure it can work safely. If you’re going for a contemporary look, you can have a lot of fun choosing design elements. Picking bold tile – an unusual color, shape, size or something that offers texture or sparkle- will add loads of visual interest. If you’re working with a brick fireplace that’s in relatively okay shape, your easiest bet is to add backerboard that can be tiled over. Look for clean lines in your mantel for a sleek and sophisticated look. 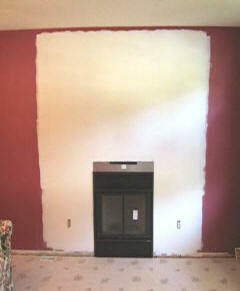 If you’re hoping to do a simpler upgrade to your current fireplace consider repainting. Painting both the brick and mantel of a fireplace all white or black can really stand out. When you’re going for a contemporary or modern look, your choice is widened when you consider gas and electric options. Many stand-alone and wall mount units are architecturally arresting and will definitely heat up the design of your room. When the overall theme of the room is traditional, seek out textured stone, brick and stone tile for your fireplace. This helps add old world or rustic charm to your design. When choosing a mantle, have fun choosing something ornate in wood, perhaps with interesting wood carvings. Looking for reclaimed wood and antique mantels are a good choice as these older woods have a lower moisture content and will shrink less when exposed to the heat of a fire.. 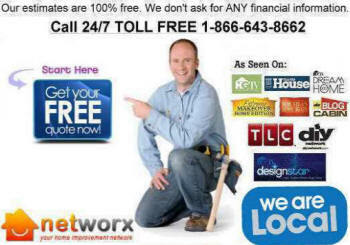 I Need Find Best Local Near Me Indoor fireplace installation contractors. fireplace are brick fireplaces with faux wood mantels or exquisite looking fireplaces made from marble and even designs that are made from tiles. The choices available can be overwhelming, so be sure that your fireplace fits in with the decor of your room.